In addition to providing high entertainment value and intrigue, the Big Ten might be the most complete conference in college basketball. As of Sunday evening, the Big Ten has four ranked teams, six more on the bubble, and as deep a middle tier as any conference in America. Michigan and Michigan State both stand as legitimate national championship contenders. After a clear delineation between those two teams and the rest of the pack, there is little stratification among the middle of the pack. The Illini have yet to pick up a conference win (though they have played Indiana and Michigan relatively close) and will be looking down the barrel every night. That won’t be easy, though they have just one remaining game against Michigan State and none against Michigan. Penn State had the makings of a solid Big Ten team prior to the season. The season lost its promise early, however, and Penn State has not lived up to its talent level, even after Mike Watkins came back. Lamar Stevens has been productive, though inefficient, while Watkins and Josh Reaves haven’t carried quite enough of a secondary load for the Nittany Lions to get by. Credit the Scarlet Knights for not being last in these rankings, as has been the case so often over the last few years. With a win over Ohio State and a close loss to Wisconsin, Rutgers has a couple of solid performances under its belt. Still, it ranks dead last in the conference in NET rating and fattened up on a weak non-conference schedule. It appears unlikely that this team will rise anywhere above the bottom few teams in the Big Ten anytime soon. The Wildcats have put together a top-30 defense, but even an outstanding season from Vic Law hasn’t been enough to lift their offense to a passable level. Ryan Taylor has provided enough of a spark, but neither he nor Dererk Pardon offers enough offensively to serve as a viable second option in the Big Ten. Also worth noting: Law missed Northwestern’s game against Michigan Sunday night with an “ongoing lower body injury”. He carries so much weight for his team on both ends of the floor, and if he is out any kind of extended time, the Wildcats may be sunk. On a surface level, Minnesota has been better than the 10th-best team in the Big Ten. But examine the season further, and nothing about the Golden Gophers seems convincing. They’re 3-2 within the conference, but both losses were by at least 15 points. They’re 13-3 on the season, but neither their offense nor their defense ranks inside the top 50, per KenPom’s adjusted ratings. Their overall adjusted efficiency margin is 52nd, in the nation – 10th in the Big Ten. Amir Coffey and Jordan Murphy are two of the best players in the conference. I believe Minnesota could be a good team, I just need to be convinced. Order the next six teams in whichever order you like. This is where the Big Ten’s depth stands out in vivid color, with a host of teams laying legitimate claim to being the fourth-best team in a supremely challenging conference. 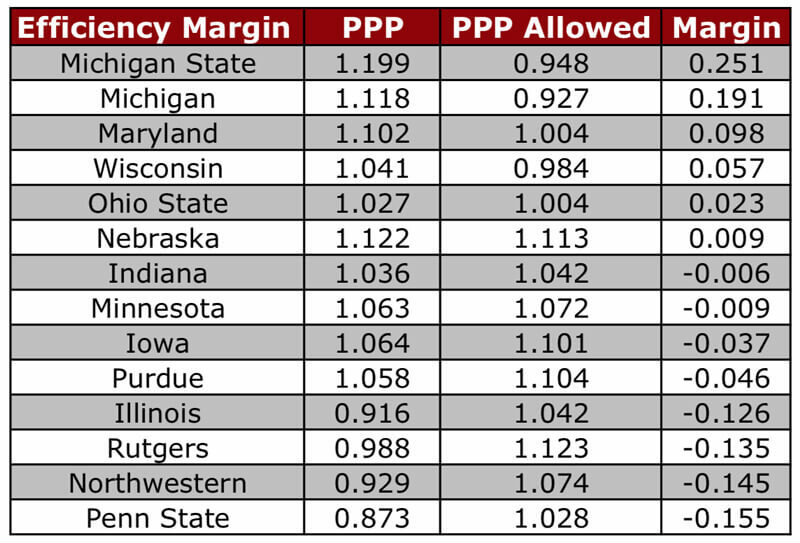 Seven teams currently rank between 13th and 35th in KenPom’s adjusted efficiency margin, and putting them in any objective order is impossible. The Buckeyes have followed up six straight wins with three consecutive defeats, including a recent loss to Iowa and a tough loss to Rutgers. Ohio State serves as evidence of how quickly fortunes can change in the Big Ten and how vulnerable a team can be on any given night. They’ll have close to a week off between games to recuperate, but schedule does not get any lighter for the Buckeyes, whose next four games include Maryland, Purdue, Nebraska, and Michigan. Ethan Happ may be the best player in the Big Ten, and the only reason why the Badgers have eked out an 11-5 record. He is the only player in the country currently averaging 20 points, 10 rebounds, and four assists (though Fort Wayne’s John Konchar and Wyoming’s Justin James are very close) and he does so playing only 32 minutes per game. Happ also has the highest assist rate of any big man in college basketball, the fifth-highest rebound percentage in the Big Ten, and the sixth-most points produced in the country. It remains a wonder that he hasn’t developed a reliable jumpshot given how skilled he is in every other area of the game, but Happ is a treasure whose final year in college basketball we should all cherish. As for Wisconsin, a hot start has been cooled off by four losses in seven games, including an ugly defeat at the hands of Western Kentucky. Iowa has built one of the best offenses in the country, though its defense leaves something to be desired. Tyler Cook deserves all-conference consideration, even at a crowded forward position, after leading the Hawkeyes to an undefeated non-conference slate. Still, something feels unsustainable about Iowa’s start. This team doesn’t shoot or defend particularly well, and has been shaky in conference play. With Penn State and Illinois coming up on the schedule, the Hawkeyes have an opportunity to pad their win-loss record before a four-game stretch that includes Michigan (home), Minnesota (away), Michigan State (home) and Indiana (away). Purdue is 10-6, but has played better than that record might indicate. All six losses have come against legitimate power-five teams, and Carsen Edwards has been brilliant all season long. They just miss out on the top five because they lack a convincing win and I trust the depth of the five teams above them more than I do Purdue’s. The schedule should get (slightly) easier from here on out, though the Big Ten offers few hiding spots. The Boilermakers have one of their two games against MSU and their only game against Michigan out of the way, and could be favored in nearly every game left on the schedule. IU might – might! – have two of the five best players in the Big Ten in Romeo Langford and Juwan Morgan, but the Hoosiers still search for consistency from the rest of the roster. They’re in the midst of their first losing streak of the season, and how they respond Monday night against Nebraska will be noteworthy. Indiana still has a real shot at a double-bye in the Big Ten Tournament, but will need to find consistent production from its role players – and get healthy – to do that. The Cornhuskers have looked sharp to date, and it feels like they still have another level to reach. Nebraska has so many threats, most notably James Palmer Jr., whose three-point shooting is beginning to tick up. The Huskers have a top-10 offense, per KenPom, and while their defense has lagged behind that standard, there is room to grow with Isaiah Roby and Isaac Copeland roaming the paint. By the way, the individual matchups of Palmer against Romeo Langford and Roby against Justin Smith will be all sorts of fun on Monday night. Riding a five-game win streak, Maryland is the hottest team in the conference outside the state of Michigan. The Terrapins have one of the strongest frontcourts not just in the Big Ten, but in all of college basketball, as both Bruno Fernando and Jalen Smith could be NBA players this time next season. Anthony Cowan is having an all-conference-caliber season, and the Terps’ role players have emerged in just the right roles to solidify the rotation. If these rankings are meant to serve as a snapshot of the conference in a given week, only two teams are playing better than Maryland right now. I must admit: I was lower on Michigan State than most coming into the season, and I have been dead wrong. The Spartans have a strong case for being the best team in the conference. KenPom favors them – slightly – over Michigan, and they have a higher net rating, margin of victory, and SRS than the Wolverines, per Basketball-Reference. They have been every bit as dominant since a late-November loss to Louisville. Cassius Winston is having an unbelievable campaign, and Nick Ward is handling an increase in usage with ease. But to unseat Michigan from the top spot, someone – likely these Spartans – will have to take it from them. I’m not there yet. Until further notice, consider the Wolverines the best team in this conference and a national title contender. 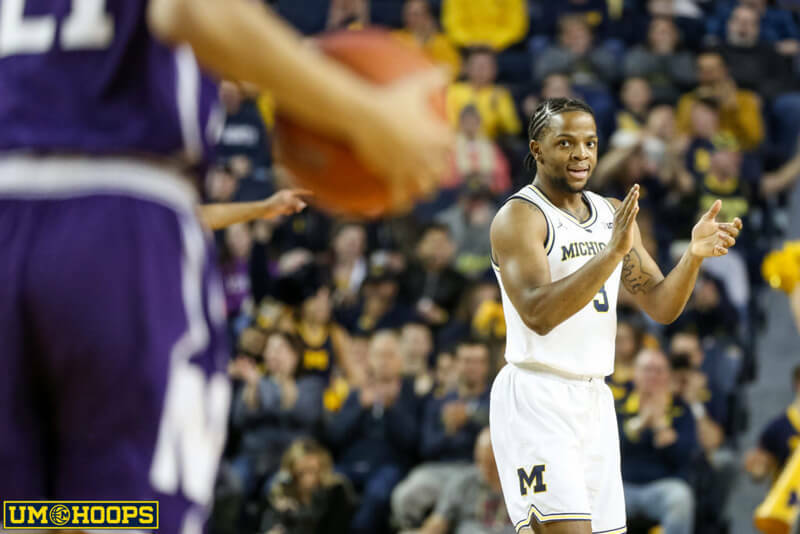 Michigan is skilled, balanced, well-coached, and connected on both ends of the floor. Its offense isn’t quite elite, but there could be untapped potential on that side of the ball. This team is a joy to watch and a pain to play. Every team that has gone up against that this season has learned that the hard way.